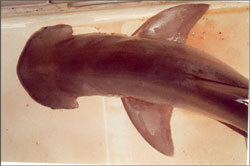 Bonnethead sharks are in the order Carcharhiniformes, the family Sphyrnidae, the genus Sphyrna, and the species tiburo. They are limited to the warm waters of the Northern Hemisphere, ranging in the Atlantic Ocean from the south of New England, to the Gulf of Mexico and Brazil. They are more common throughout the Caribbean Sea including Cuba and Bahamas. The Bonnethead is also occasionally found in Bermuda. In the Pacific, this shark can be found from southern California to waters off the coast of Ecuador. Bonnetheads move closer to the equator as waters grow colder during the winter months. Bonnetheads feed during daylight hours primarily on crustaceans, dominated by blue crabs. They also feed on mantis shrimp, pink shrimp, mollusks, and small fish. They are believed to mate during the spring and autumn or perhaps even year-round. In the waters off the coast of Brazil, mating occurs during the spring. After mating, the females can store sperm for up to four months prior to actually fertilizing the eggs. The control that they have over the fertilization period is believed to be an adaptation to ensure that the pups are born during the best conditions for their survival. Considered harmless to humans, this species is rather shy. There has been only one recorded unprovoked attack attributed to the Bonnethead. Larger sharks are potential predators of the Bonnethead. Vision and hearing capabilities are exceptional as well as the sensitivity of the lateral line to small vibrations, alerting them to nearby potential prey.